The pair of Humidifiers by Bluestone silently adds moisture to the air, helping create a more comfortable atmosphere for anyone with sinus or allergy symptoms. Requiring no electricity or batteries, these humidifier’s run silently letting even babies sleep through the night. IMPORTANT: Avoid buying counterfeit products and transacting with unauthorized sellers. Look for our logo on the packaging for every one of our products. Bluestone is committed to providing the consumer with the absolute best price and value on all our products, which we ensure by applying a rigorous Quality Control process. Bluestone is a registered trademark protected by U.S. Trademark law and will be vigorously defended. 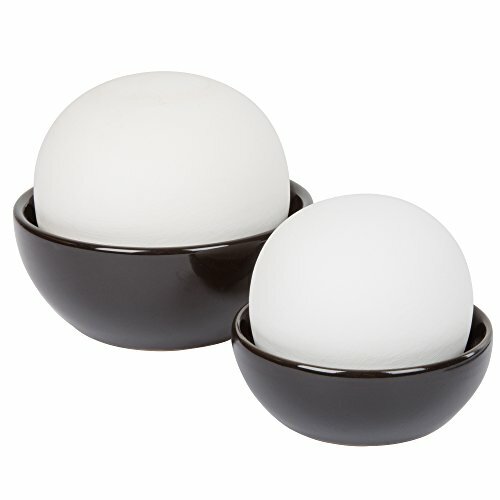 EASY TO USE- These hassle-free pair of decorative bedroom humidifiers by Bluestone can be used by any age. Simply pour water in the black bowl or on top of the clay sphere and start humidifying any room. QUIET- Sleep through the night while silently humidifying any room in your house. These two clay aqua ball humidifiers are cordless, non-electric, and battery free adding no additional noise to your bedroom letting even babies sleep through the night. TRAVELS EASILY- Now you can breathe easy and keep your allergies at bay anywhere you go with the help from the Non-Electric Ceramic Humidifier by Bluestone. Both sizes are small enough to fit in any travel bag making it perfect for hotel visits, sleep overs, and dorm rooms. PRODUCT DETAILS- Dimensions: Small humidifier- 3.5" (C) x 3.25" (H), Large humidifier- 4.5" (C) x 4" (H). Material: Clay sphere and Ceramic bowl. Color: Black and tan. SATISFACTION GUARANTEED- Bluestone is committed to providing consumers with the absolute best price and value on our entire line of products. NOTE: This is an exclusive product of Bluestone and ONLY Clay Aqua Ball Humidifier by Bluestone are GUARANTEED to be genuine. If you have any questions about this product by Bluestone, contact us by completing and submitting the form below. If you are looking for a specif part number, please include it with your message.